If you are not a subscriber to the Old Paths Advocate here is an example of what you are missing. Compromise can sometimes be a good thing. However, when it comes to serving God, compromise is not a good thing. I hope you enjoy this excellent article by Carl Johnson on the subject of compromise. Mark Twain says that early in his life he moved to a mining town in Colorado. The town was wide open with brothels and bars on every corner. Twain says, “I immediately recognized it was no place for a Christian-so I decided not to be one.” Many people have imitated Twain’s response. When they find it hard to be a Christian, they either quit trying to be one or they compromise their convictions. Jesus directs some of His harshest words toward the sin of compromise embodied in the doctrines of Balaam and the Nicolaitans in the church at Pergamos (Rev. 2:12-17). Both doctrines were efforts to adjust Christianity to the level of the world rather than lift the world to the level of Christianity. They taught the people to go along in order to get along, in short, to compromise. However, Jesus says he “hates” the doctrine (2:15), and the Scriptures warn us repeatedly against it (2 Cor. 6:17; Rom. 12:2; 2 Tim. 2:19). Pharaoh’s dealing with Moses is a classic example of how the devil uses compromise to thwart God’s children from reaching the Promised Land (Ex. 8:25-10:26). At God’s orders, Moses and Aaron demand that Pharaoh release every family and tribe of Israel out of Egypt. Pharaoh does not wish to grant any part of their request, but sees he is going to have to yield to some extent. He feels, however, that he can save his dignity and protect his own interests by yielding less than what is demanded. On four occasions, he offers to compromise. In Pharaoh’s second attempt at compromise he tells Moses they can leave Egypt, but they cannot go too far (8:28). He will let them go as the cat lets the mouse go, just so far but no farther-not out of his reach. The offer may have sounded good to Moses. They would at least be separate from the Egyptians. Moses rejects the ofer, however, because it is not what God commands. After Moses rejects the first and second offers, Pharaoh sees he has no alternative but to release the Israelites beyond his reach. He devises a third compromise, however, by which he thinks he can draw them back. He tells Moses the people can leave Egypt, but they must leave the women and children behind (10:8-11). Pharaoh knows that if the men go into the wilderness for 3 full days they will soon return to their wives, children, and slavery in Egypt. Moses refuses the compromise and demands everyone must go. Male, female, old, and young must be set free. The fourth offer by Pharaoh is the craftiest of all. He says the people of Israel may leave Egypt, but they must leave their flocks and herds of cattle behind. God has not made specific mention of the animals to Moses and they are not descendants of Israel, but a nomadic people cannot subsist for many weeks scarcely for many days without its flocks and herds. The Israelites would have been starved into surrender. Furthermore, they cannot leave Egypt empty-handed; without the means for worship. The flocks and herds will be needed to make sacrifices to Jehovah. 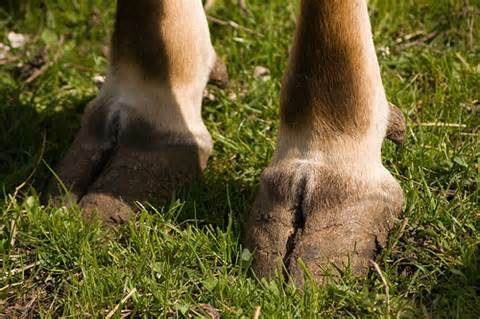 Even though God does not mention them specifically, Moses necessarily infers the livestock must be kept as part of God’s plan. He rejects Pharaoh’s offer by declaring, “Our livestock also shall go with us; not a hoof shall be left behind” (10:26). Pharaoh is enraged by Moses’ refusal to compromise even “one hoof’ (10:27-28). Pharaoh’s response is typical of evil men when they are unable to overcome the convictions of good men by compromise. They usually throw off the mask of friendliness and show their true colors. How much do you know about the Bible? In our article for today, Carter Culbertson exhorts teenagers to be more diligent in Bible study. Teenagers growing up today face many struggles. I think one thing that we as teenagers need to do more of, is make more time for God in our daily lives. This is something, we all, including myself need to work on. It seems that our busy lives today are jam packed, and all we have time for is work, work, work, and more work. 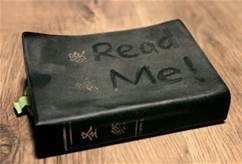 We need to cut out the unnecessary things that we waste time doing and start reading our Bibles. Not just reading, but actually studying the Word of God and knowing what is actually being taught. Acts 17:11 says, These were more noble than those in Thessalonica, in that they received the word with all readiness of mind, and searched the scriptures daily, whether those things were so. When we have a test, we usually take time and study and know it backwards and forwards. At least, that is what we should do. That is how we need to start studying the Bible. Statistics show that the average American cannot name all four gospels. That shows we need to take more time out of our schedules to learn about God, who gave his only Son for our sins. Have you ever talked to someone who said they were an atheist? You probably have,and most likely they acted superior to you because you believe in God. In our article today Aaron Battey gives 3 questions that the atheist cannot answer. We hope you enjoy it. There are many facts of nature that the sad and hopeless belief of atheism cannot explain. To make it more personal, the atheist today will go by the name of John. You have probably talked to John at some point in your life, but did you ever think to tell him these three profound truths to which his atheistic beliefs have no reply? First, John cannot explain the very first origins of life. You have probably heard John say something like, “Well, we are still looking into that,” when you asked him to explain where the chemicals that produced the first life form originated. John believes that all things come from materials that you can detect with the five senses. However, there is no proof whatsoever that a certain combination of chemicals (which, themselves, came from nowhere apparently) in even the most ideal conditions can produce life of any kind. Scientists definitively disproved this theory of spontaneous generation years ago. Only a real and living creator can explain the miraculous phenomenon of a mature earth and man coming out of nowhere. Genesis 2:7 explains, “And the Lord God formed man of the dust of the ground, and breathed into his nostrils the breath of life; and man became a living being.” The natural principle -everything that had a beginning had a cause- is only satisfied by the greatest cause of all. That cause is God who is “Spirit” (Jn. 4:24), outside the realm of time and space. Second, John cannot explain where thoughts and cognition come from. Materialism is the belief that everything in existence has a material origin and can be sensed by the five human senses. This doctrine is also the crux of atheism and evolution. Did you know your friend John believes in this doctrine? Did you ever think to ask John how immaterial “thoughts” could have originated from material “chemicals”? If you have ever asked John this question, his reply was undoubtedly, “Well, we are still looking into that.” The atheist has no response, but the Bible does. Once again the scriptures provide us with the answer when they say, “For as the heavens are higher than the earth, so are My ways higher than your ways, and My thoughts than your thoughts,” (Isaiah 55:9). Only someone who is smarter than humans could have created humans. This is a basic truth that John and any rational scientist must agree with. Nonetheless, there will always be those who deny even such basic truths. To such minded people the Bible also says, “But God has chosen the foolish things of the world to put to shame the wise,” (1 Cor. 1:27). Lastly, John cannot explain the origin of morals. After all, how much does hate weigh? Is there an atom for love? What is the chemical composition for the murder molecule? If you were to ask John about the existence of morality he might be puzzled; thus, these three follow-up questions are good to instill to your memory. Morality, just like thoughts and cognition, is immaterial and cannot be explained by atheism. Since atheists cannot explain this phenomenon, they claim there are no set morals. Where does this type of thinking lead? It leads to humans killing babies, Hitler annihilating a human race, and John cheating on his wife. In contrast to this ludicrous thinking, the Bible says that Eve’s “eyes…were opened” after she ate of the forbidden fruit (Gen. 3:7). She became aware of a set standard of right and wrong. The origin of morals and a human conscience did not occur by accident. Search the scriptures for yourself to see if the claims in this article are true and accurate. More importantly, use some common sense and realize that this intricate universe we live in is not due to an accident. Accidents bring about only more disorder, but God and His Word offer order for your life. As Christians we should not let the world color our thinking. When we allow the world into our lives, God is crowded out. In this article I have given 3 warnings found in God’s word given about worldliness. With this article in mind, would you not consider your life and see where you stand? One of the greatest problems facing the church today is the problem of worldliness. As we will see in this article this problem has always plagued God’s people and numerous warnings are given in God’s word. The word “worldliness” is not found in the standard versions of the Bible, but there is no doubt that the trait is often referred to. In defining the word “worldliness” we would say it is the condition of being worldly. The Bible tells us that the “world” we are not to embrace is not just the world we live in, but it is the moral and spiritual chaos that is opposed to and alienated from God. Any person who loves the world and who is influenced by it stands in opposition to God and is alienated from Him. Worldliness is being disposed to things pertaining to this temporary world; not regarding the spiritual or religious realm but being secular. In this article we will notice 3 warnings given against worldliness and the world. First, we see that we are not to be fashioned by the world. Rom.12:2 And be not conformed to this world: but be ye transformed by the renewing of your mind, that ye may prove what is that good, and acceptable, and perfect, will of God. The apostle Paul is telling his readers, to not fall in step with the people of the world. Christians are constantly being pressured to be like the world. People of the world do not want to live right and they are not too happy about having people around them who live right. They don’t want anyone to rebuke them for their evil behavior. People of the world will often use harassment, ridicule, and other techniques in an attempt to make the Christian conform to their standards. Paul says, “Be not conformed”. Don’t fall in step with the modern world. Christians should not allow worldly people to determine how they talk, dress, and how they spend their leisure time. If one is a Christian, then Christ sets the standards. When a person lets the world dictate his behavior, he is not a follower of Christ. Second, we see that we are not to be lovers of the world: 1 John 2:15-16 Love not the world, neither the things that are in the world. If any man love the world, the love of the Father is not in him. For all that is in the world, the lust of the flesh, and the lust of the eyes, and the pride of life, is not of the Father, but is of the world. 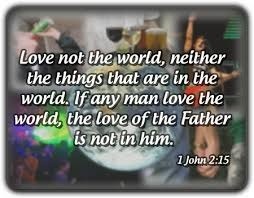 John could not be any clearer; a choice must be made between loving the world and loving God. He tells us what the world is made of and what we must avoid; Lust of the flesh is what feels good, Lust of the eyes is what looks good, and Pride of life is what makes me look good. Love for these things excludes love of God and vice versa. All that the world stands for is opposed to God and will perish. Lastly and third, we are not to be stained by the world. James 1:27 Pure religion and undefiled before God and the Father is this, To visit the fatherless and widows in their affliction, and to keep himself unspotted from the world. The life of the Christian should not be stained by worldly behavior. People who see nothing wrong with worldly activities such as drinking, dancing, vile language, immodesty, and so on are showing their love for the world. Unfortunately, when people in the church act in such a manner, they lower the standards of the Gospel. They want to behave like the world and maintain respectability in the church. This is impossible. To practice “pure and undefiled religion” one must abstain from all appearance of evil, 1 Thess. 5:22. In conclusion, Christians are to be the “light of the world, a city that is set on a hill”, Matt 5:14. Light is no good unless it penetrates the darkness. If light becomes darkness, how great is the darkness? That is what happens when Christians, become worldly. The power is in contrast, not comparison. 2 Corinthians 6:17-18 Wherefore come out from among them, and be ye separate, saith the Lord, and touch not the unclean thing; and I will receive you. And will be a Father unto you, and ye shall be my sons and daughters, saith the Lord Almighty. May all those who wear the name Christ come out of the world and be separate.